City Collegiate School in Mymensingh is now one and a quarter centuries old. The school has had a very important role in spreading education in the district of Mymensingh as well as the surrounding region that includes Jamalpur, Sherpur, Tangail, Netrokona and Kishoreganj. In 1883, Ananda Mohan Bose, a prominent nationalist leader established this school to benefit the underprivileged. Bose was born in 1847 in Kishoreganj, a Sub-Division of the then Mymensingh district. He was the son of a landlord and passed his entrance (now SSC) exam from from Mymensingh Zila School. He did his FA (Now HSC) and BA from the Presidency College in Calcutta securing first position in both respects. Because of his outstanding results, he obtained the Premchand Roy scholarship in 1870. He went to England for higher education where he studied higher mathematics. Later, Bose returned to India and got involved in social reforming which led him to establish educational institutions. He established the Bangla Mohila College in Calcutta in 1873 and the college became known for promoting education among women in both Hindu and Muslim societies. Later in 1878 he established the City College in Calcutta with its own section in Mymensingh. Finally the school was established at the residence of Ananda Mohan in 1883 and it was named the City Collegiate School. Bose, who was a member of the Brahma society, died in 1908. He was the member of Indian Education Commission and a member of the Calcutta University Senate. A number of headmasters have made their marks on the school. The heads of the school from its establishment in 1883 till today are Babu Girish Chandra Sen (from 1883 to 1923); Monoranjan Banarjee (from 1924 to 1940); Khitish Chandra Chakrabarti (from 1940- 1941); Animesh Das Gupta (1941- 1950); Monoranjan Bhattacharya (from 1950- 1959); Dhirendra Kishore Dhar (from 1959- 1959); M Anjam (1959- 1960); Babu Sukumar Bhattacharya (from 1960-1961); Mofizul Hoque, (from 1961- 1967); Babu Jogesh Chandra Chakrabarti (from 1967 1968); Md. Shahidullah Khan (from 1968 to 2005); Md. Hafiz Uddin (from 2005 to 2006); and Abdul Matin, the present headmaster of the school. The current head is Abdul Matin who joined in 1965 as an Assistant Teacher said that the school has some 200 students and the SSC examination results are good. The school has its place in the sentiments of the people of Mymensingh but now it is facing real problems of shortage of students, teachers and other facilities. The school library has a good collection of rare books but is not preserved properly. 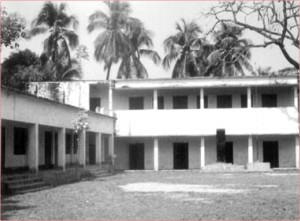 AKM Julfiqur Kabir, a former student of the school, also a member of the school governing body said that the school had some 1800 students in three groups after the Liberation War. Julfiqur Kabir who passed his SSC from the school in 1977 also said that every year the school got places in the combined merit list of the Dhaka Board but now its performance is much worse. On average, the passing result of this school was over 60 percent and the result of this year's SSC examination could be better than the previous years, he said. Remembering his school days, Nazib Ashraf, a photojournalist and cultural personality of Mymensingh said that old students and prominent people of the district should come forward to take the school back to its past success. Ashraf is President of the Bangladesh Photo Journalists' Association (BPJA), Mymensingh.